The Victoria Prison Registers 1871-1960 were compiled from both the Central Register of Male Prisoners and the Central Register of Female Prisoners, held by the Public Record Office Victoria. These were registers kept of prisoners that passed through Pentridge prison in Coburg, Victoria. They contain not only transcripts and scans of the original registers themselves, but also the mug shot photographs of individuals that were often included. As you might expect, crime and punishment operated differently in Victoria in the 19th and even 20th centuries, and some behaviours were considered criminal for our ancestors then that may no longer be viewed as such now. Gaols were used to detain prisoners who were not sentenced to hard labour, such as the old and destitute, debtors, those who were considered ‘lunatics’, and children who had been convicted of being vagrants. In 1871, the Statute of Gaols Amendment Act was introduced in the colony of Victoria, which led to the Penal and Gaols Branch being established within the colony’s Chief Secretary’s Department. This branch was responsible for managing gaols and penal institutions within Victoria, and for managing the control of both adult and juvenile prisoners within them. In Victoria, prisons had to submit information about the prisoners in their care to the Penal and Gaols Branch. 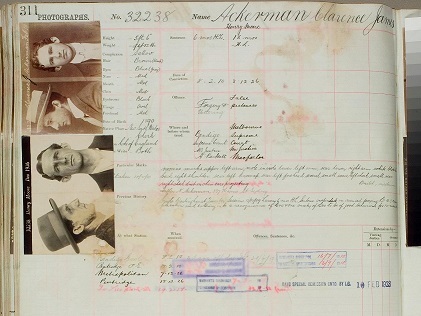 These registers contain fascinating details about not only the prisoners’ offences, sentences and incarceration, but also biographical information such as their name, date of birth, country of origin and occupation. Remarks on the register may also include the name of the ship on which the prisoner arrived if they were not born in Australia. Perhaps most excitingly for family history researchers, they often also contain more colourful details such as information about their behaviour in gaol, and even about their physical appearance. Many of these records even include mug shot photographs of the prisoner in question. The registers were arranged in order of the prisoner registration number. If an offender committed another later offence, the authorities would record details of these misdemeanours under the same original registration number. This is particularly handy for researchers whose ancestors had many brushes with the law over the course of their life. However, note that the Victoria Prison Registers 1871-1960 do not contain records of prisoners from all around the state. In fact, centralised, state-wide registration of prisoners did not begin in Victoria until as late as 1985. These records specifically contain details of prisoners that passed through Pentridge. HM Prison Pentridge was built in 1850 in Coburg, north of the state’s capital of Melbourne, and was in operation until its official closure in 1997. It was the central prison in the Melbourne region from about 1860. There was also a women’s prison within Pentridge. By 1894, there were 195 female prisoners in Pentridge, and a new three-storey building was erected to accommodate them. This was supervised by a female governor and staff and maintained until 1956. These records are unlikely to contain records of prisoners who were not detained within Pentridge. In the 19th and early 20th centuries, prisoners were commonly moved directly from the court where they were on trial to a local prison, for example Beechworth. For researchers whose ancestors appeared in a trial outside the Melbourne area, it is recommended to consult the records of local prisons instead.